The Ruger SR9 is an interesting pistol that would technically be considered a compact handgun by many, but it’s barely under the technical specifications for a full sized weapon, and it certainly handles more like a full sized weapon as well. There are a lot of unique features to the gun, which is why we made this review of the best Ruger SR9 accessories available. The accessories we chose are specific to enhance the already existing features that come with this pistol. Probably the most noticeable part of the Ruger SR9 is the grip, which has an ergonomic shape to it with the lack of finger grooves. The curved, rear part of the grip has a grooved surface and increases the palm swell, which is why the weapon may not feel quite like a compact. Also unique to the Ruger SR9 is the included accessory rail under the barrel. We picked a few accessories that will really highlight what Ruger has designed, so you can’t go wrong with any of the items in this review. Materials – The Pachmayr Tactical Grip Glove is constructed of a soft rubber, in all black, which stretches over the grip of your Ruger SR9 and snaps tightly into place. The rear of the grip glove features the same grooved pattern that is on the pistol’s original grip, so as not to take away from the innovative design by Ruger. The sides of the grip have ventilated holes, to reduce sweat build up. Also featured are finger grooves at the front of the grip, to enhance the hold and performance while shooting. This grip is custom molded and is even used by some police force and FBI. Performance – This grip glove is, we think, one of the best Ruger SR9 accessories you can buy. While it’s obviously pretty cheap, we think the Pachmayr grip sleeve perfectly maintains the better features of the pistol’s original grip and enhances areas where it could use improvement. The glove keeps the same grooves that support the palm, just like the Ruger’s actual grip, but it also adds in the finger grooves, which is lacking on the pistol. With the addition of the ventilation holes, it’s hard to go wrong with this one. This grip glove will obviously change your palm swell a little, which could be a problem since the original grip already increases the palm swell in the rear. What we say – This accessory for your Ruger SR9 is the best option if you aren’t a fan of the flat and curved front area of the grip. Having the added finger grooves here is the biggest benefit in this purchase. Materials – This outside the waistband holster by BLACKHAWK! is made of black polymer, and it has a carbon fiber applique on the exterior. 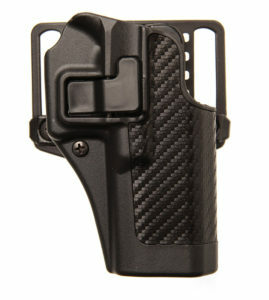 Included in the holster’s price is the belt loop and paddle attachment. Drawing your weapon will become faster and smoother than before, thanks to the unique auto lock release button. 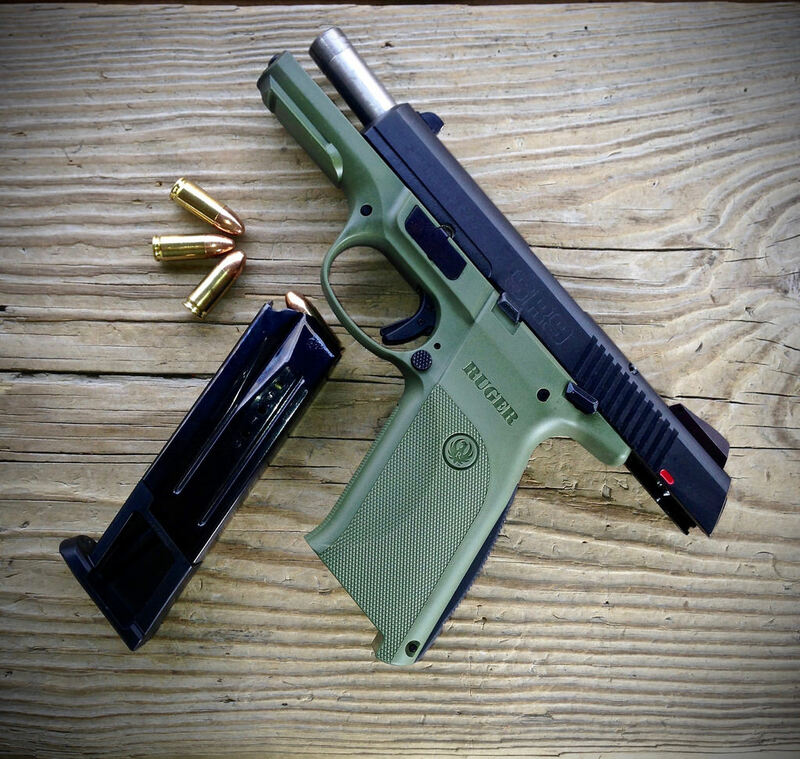 Instead of fumbling with a thumb break, simply hold down a button to release your Ruger SR9. Holstering is just as easy, as you’ll hear an audible click once your handgun’s trigger guard has locked into place. There is a single passive retention screw on the holster, which you can adjust to your liking. Performance – There are many OWB holsters that would work well as a Ruger SR9 tactical accessory, but we really like the BLACKHAWK! Serpa line of holsters the company offers. The basic paddle platform is the perfect width. Surprisingly, not many holsters actually include this part, so that’s a nice bonus as well. We would prefer a little more retention, and the carbon fiber applique is a bit distracting, to say the least. However, this is a great holster that will protect your Ruger very well. The auto lock and release button is highly more functional than a thumb break, and it will reduce your need to look down when you need to draw. What we say – This holster by BLACKHAWK! is the best option for those who will frequently be standing with their handgun at their side. The appearance is fairly discrete but still means business. Materials – This night sight set by Deadringer Hunting is a pair of uniquely designed rear sight and single dot front sight. All the metals used to construct the sights are 100% military grade. 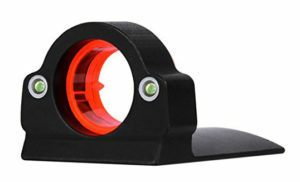 The rear sight features a wide, open ring, which is illuminated with a vibrant orange interior. Also on the rear sight are two green tritium inserts with reflective, white painted rings. The front sight is a standard night sight, which features the single tritium insert and white painted ring. These sights are visible during both prime daylight hours as well as in the dead of night. The Snake GP-Series Tritium Pistol Sights should be professionally installed by a gunsmith. Performance – You really can’t go wrong with a set of night sights, and Deadringer Hunter’s snake eye sights are always a big winner. There are the obvious benefits of three tritium inserts, which are known to last for over a decade, and the contrasting painted rings. When the tritium is glowing brightly at night, that internal orange ring is very illuminated and makes it incredibly easy to point and shoot. There’s basically no guesswork involved. The downside to installing a pair of night sights is that you’ll likely have to shell out more cash for it to get done professionally. However, they’ll make an effective permanent addition to your handgun. What we say – The Deadringer Hunter Snake GO-Series Tritium Pistol Sights are the best Ruger SR9 tactical accessories for anyone who doesn’t think the regular three dot sights will cut it for them. This will be beneficial for self defense, as well. 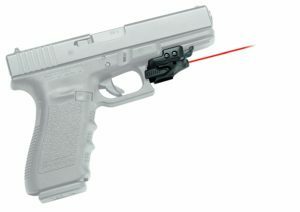 Materials – The Crimson Trace mounted laser is made with an all polymer housing, which protects the red laser technology inside. Instead of installing over an existing trigger guard, it attaches to the original Picatinny accessories rail, which is already included on your Ruger SR9. The red laser puts out a strong and powerful 5 mw beam, and it can last up to four hours of consistent use. The power switch is ambidextrous, and can be turned instantly on and off with a simple finger tap. The laser’s housing is ergonomically shaped, so as not to interfere with the shooter’s natural grip. It can also be adjusted for windage and elevation. Performance – This laser from Crimson Trace is another good accessory for your Ruger for not only tactical but also self defense purposes. 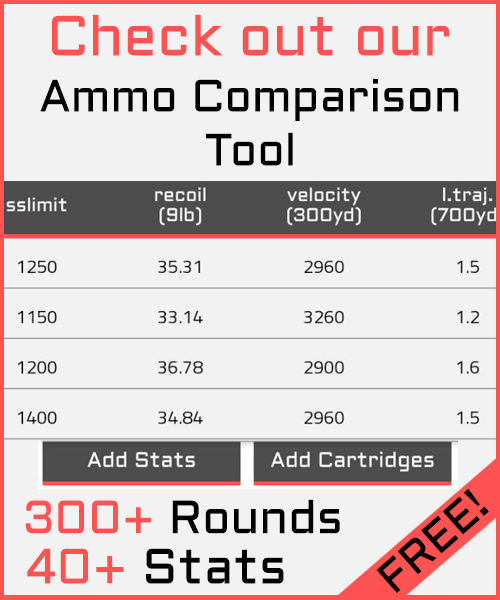 If you don’t want to have a permanent installation on your pistol, then this will be the best choice for you. The red laser is powerful and crisp, which eliminates your guesswork as well. By avoiding the cover over the trigger guard, you’re making sure there’s less of a chance the accessory will interfere with your shooting or even using a holster you may already own for your Ruger. Crimson Trace creates some very high quality products that are durable and will last for a long time – exactly what someone with tactical purposes in mind needs. Such a small accessory is pretty expensive though, so make sure it will be a worthy investment to you. What we say – The red laser by Crimson Trace is the best Ruger SR9 accessory for anyone who wants to utilize their Ruger’s accessory rail without interfering with the rest of the weapon. Installation is 1-2-3, so simply tap that laser on and go! 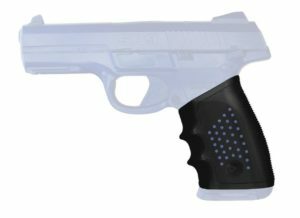 Our favorite Ruger SR9 Accessory is the Crimson Trace Laser. Although it was the most expensive accessory in this review, it’s actually pretty cost-effective, compared to many other lasers on the market. The accessory rail that’s included on the Ruger SR9 is a feature we’d really like to utilize, so this laser is a great way to do that. Installation or detachment is much simpler than the other types of lasers that need to go over the trigger guard. Plus, you’re reducing the added weight of your handgun. The laser is strong and bright, and the easy pressure switch is perfect for someone who needs to act quickly. Having a laser will be helpful at night as well, especially if you’re not interested in a more permanent accessory, like the night sights. Small and lightweight, you really can’t go wrong by considering purchasing the Crimson Trace Rail Master Universal Mount Laser.